Get the job skills to work in the food industry while making meals that help feed fellow Marylanders in need. What is the FoodWorks Culinary Training Program? 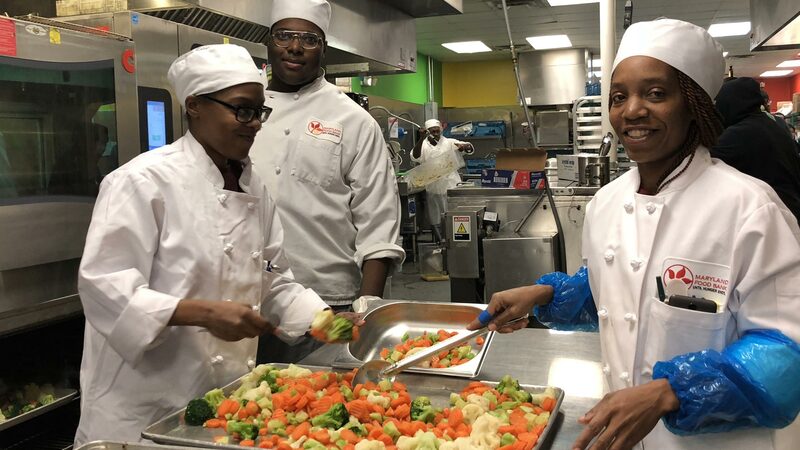 Through a unique collaboration with the Community College of Baltimore County (CCBC), the FoodWorks Program offers a fresh start to low-income individuals with 12 weeks of intense culinary training. FoodWorks students learn basic cooking skills while converting fresh produce and other perishable foods into healthy meals for distribution to those in need. Located at Maryland Food Bank headquarters, the program training takes place in classrooms and in the Charles T. Bauer Community Kitchen, a state-of-the-art culinary facility opened in 2010. Over the course of 12 weeks, Maryland Food Bank Executive Chef Manny Robinson guides a select group of students through a curriculum that includes fundamental culinary techniques, nutrition, menu planning and job-seeking skills. 12 weeks professional training – Students learn basic cooking techniques, discipline in the workplace, and professionalism. ServSafe® certification – This certificate confirms to prospective employers that the graduates are experts in food safety. Job placement – The food bank helps find full-time employment for graduates, who earn well above the current minimum wage. Program staff has helped FoodWorks graduates land jobs at leading venues in the region’s hotel and restaurant industry. The Maryland Food Bank also proudly hires some graduates as program mentors and kitchen staff! 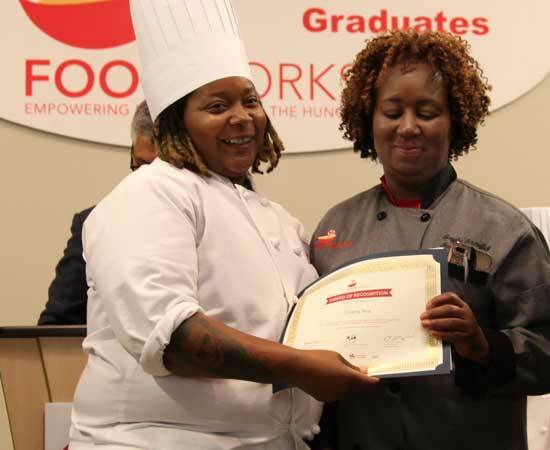 FoodWorks graduates have been hired at top kitchens such as Horseshoe Casino, Compass group, Woodberry Kitchen, SEED School, and BCPS. This program gives me a chance to give back because I know what it’s like to be in that situation. And if you’d like to attend one of our upcoming information sessions or learn more about the program directly from our program coordinator, please email foodworks@mdfoodbank.org or call (410) 737-8282 ext. 231.